Is Pink Slime on the Menu at Your Public School? You have probably heard of pink slime in ground beef in the past couple weeks. It’s been all over the news. If you haven’t, take a minute to watch this video from whole food advocate Jamie Oliver. Make sure you aren’t eating when you watch, or haven’t just. I can’t promise you that you won’t gag. It is outrageous that meat manufacturers are allowed to use up to 15 percent of this goop, what is essentially meat waste byproducts (think connective tissue and scraps), mixed with the chemical Ammonia, into meat sold in grocery stores without labeling it. No where is it labeled that the chemical Ammonia was used in processing. And according to Oliver, pink slime is in over 17 percent of all meat products. Specifically, according to HealthPop, one of this biggest markets for this ghastly stuff is schools. They are reportedly using 7 million pounds of it in student lunches. You can debate whether this stuff is safe to eat, as many folks have and are. But the bigger question to me is, should this even be considered food for humans, and why are many people just hearing about this now? Why don’t we know what is in our food, and the food schools are feeding our children? Just when you think your voice doesn’t make a difference, think again. Because of the outrage over pink slime, schools are rushing to get it out of their school lunch programs due to parent feedback. Schools are listening, according to the New York Times. Is yours? Find out and advocate for local, grass fed beef in your school. In the very least, make sure they aren’t still using meat products made with pink slime. Call and ask if your school excepts USDA beef, as not all do. If they do, ask what they are doing about the pink slime in government beef. If they don’t know, explain that you are concerned about the health and safety of this meat and chemical byproduct. Share the video, Jamie Oliver’s new site Stop Pink Slime, and this post, or other news articles. If you meet resistance, or feel like the school officials don’t know, or won’t change, ask some of your friends and fellow parents to call and express their concerns as well. It does make a difference and has in many schools nationwide. 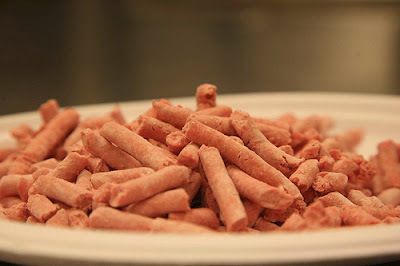 The USDA announced on March 15th that for the next school year it would offer a ground beef option to the school lunch programs nationwide that does not contain pink slime. Thing is, though, schools have to know it is an option, and sign on to it. So, your voice really matters in promoting that option for your child’s school. Who else is listening? Kroger, Safeway and Stop and Shop have said they will not sell beef that contains it. McDonald’s, and other fast food restaurants have pledged to stop using it as well. To me, this is evidence of a food revolution, and the power of social media. We need to know what is in our food, where it comes from, what it is treated with, and how it will effect us. Especially in food for our children. More and more people are waking up to how far we have come from local food systems that benefit our bodies, communities, and the land. I’m glad to see this issue was finally exposed– which has been written about by Eric Schlosser in Fast Food Nation and illustrated in Super Size Me and Food Inc. The difference now is that bloggers, parent activists, and health advocates, can showcase a problem and call for change through social media and make a difference. Case in point: the petition listed below was started by a food blogger, and now the issue is plastered all across the media and the USDA has made a change in it’s policy for the next school year. What do you think of the pink slime debate? Please sign this petition to tell the USDA to stop using pink slime in all food for schools, not just those that know enough to select the option. Visit Jamie Oliver’s site to learn more and The Lunch Tray to stay up to date on this issue.